So, I was ordering pizza the other night (Dominos) and as I finished my order the Pizza Tracker widget popped up. I couldn't help but think, "Why don't retail pharmacies do that?" I sat down and sketched out some ideas and mock-ups, and tried to put together how I think a 'Prescription Tracker' would look and could then be used. I started out by talking to my wife who is a retail pharmacist with over a decades worth of experience, and a few friends to get the process down. Mainly I wanted to put an order to the tracker that followed along with the workflow in the pharmacy. 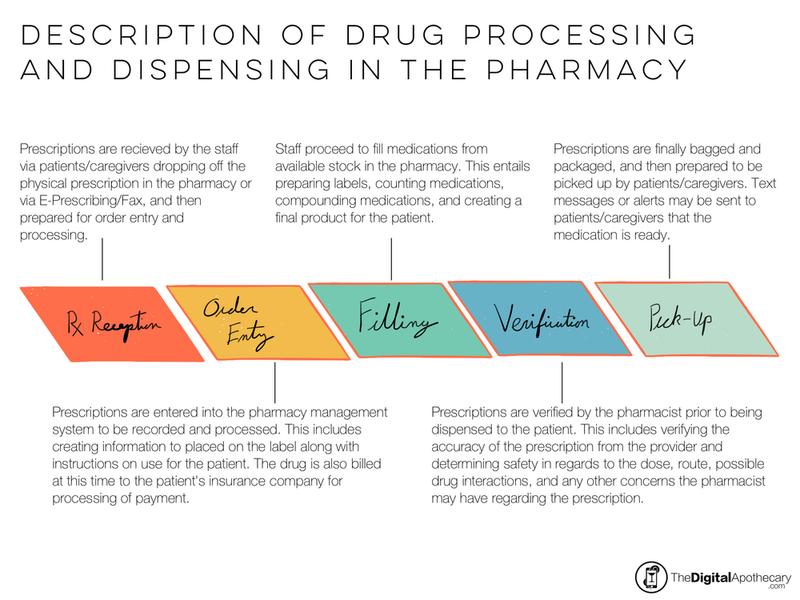 After making the workflow design, I then wanted to think about where and what could go wrong with a prescription at the pharmacy. Many patients in my colleagues and my own personal experience (and many patients I am sure) can attest to the fact that not all prescriptions can be ready in 15 minutes, and that there are many roadblocks along the way. I sought to identify common problems and potential solutions the pharmacy staff come up with. Identifying and communicating issues to patients via tracker could be very beneficial in terms of alerting them to problems instead of having them come into the pharmacy and be frustrated. It could serve as an informal communication tool between the pharmacy staff and patients/caregivers getting medications. I then set about trying to make a design on how a tracker would actually work and could then be communicated to a patient. Some of my considerations would that be each numbered step would light up or become a color as the pharmacy moves to that step. If there are any issues, an alert or notification would be passed onto the patient/caregiver. Other factors could be the whitespace in the middle of the bottom could be used for instore advertisement, or my personal favorite, a means of communicating to patients they qualify for MTM (medication therapy management) services and have the oppurtunity to learn more. I also think supplying the cost of the drug is beneficial, and what insurance the claim was processed through so that the patient knows (and perhaps data on the insurance information could be viewed if the patient feels something is amiss). Finally, a communication and alert system on what any problems arise and what the staff is encountering could be built in, and if the patient has any questions they can then call the pharmacy. I tried to imagine what this would look like in the patients hand, and really I would envision it tablet and smartphone friendly, so they can see the information on the go. Overall, I am pleased with the design, and I think it would be interesting to see if it could be implemented. There are multiple questions I have on whether patients would like it, how to integrate it into the pharmacy workflow and computer systems, other information that could be added, and finally whether it really would be helpful.